Your MTU - also known as the Maximum Transmission Unit - value is a restriction set to have a limit of the amount of data that may be sent per packet. You can check more details by visiting the Wikipedia Page. How do I check and edit the MTU? The way you can check your Maximum Transmission Unit is by accessing the Wireless Settings via the indicator on the panel at the top of your desktop. Click on , and then select 'Edit Connections...' from the menu. And should select the one which holds the Internet connection you're having trouble with. For this example, I have made a fake Internet connection. The settings should be the same for all types of connections. Select the connection you're having trouble with, and click 'Edit'. You should then check the MTU value. If it is not on Automatic, you may want to change this. I know they're the most well done ticks and crosses ever. No need to be jealous. If your data is larger than the MTU, then it is simply split up into multiple packets. 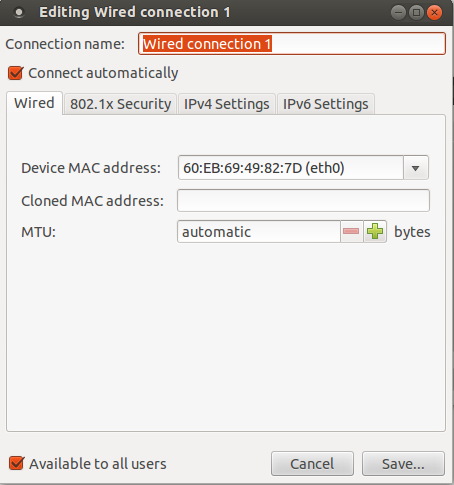 Why can't Ubuntu access my Raspberry Pi across LAN? How do I override an MTU provided by DHCP? How can I make Ubuntu automatically detect the correct timezone based on my internet connection? How to fix the “Connection failed with error: Failed sending banner …” for ssh?